The next Film night will be on the 2nd February when we will be showing the film Whisky Galore. This is a British film, a remake of the 1949 Ealing Comedy of the same name. Admission is £5 (including coffee and biscuits) and the films starts at 7.15 pm, all welcome. 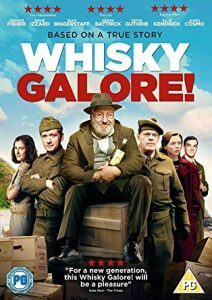 The film is a celebration of canny Scots outwitting humourless (and partly English) officialdom: a ship runs aground on a fictional Hebridean island during the second world war and the locals do their best to liberate some of the thousands of whisky bottles in its cargo. Cue cat-and-mouse shenanigans as the home guard try to reinforce wartime discipline and prevent imbibement above and beyond the quota level.